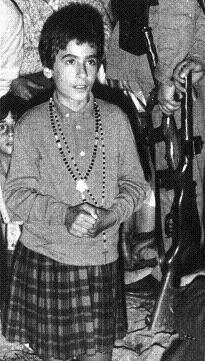 Mari Cruz González was the one of the four girls from San Sebastian de Garabandal, Spain, who had had great number of apparitions of Archangel Michael and Our Lady during the course of 1961-1965 years. Mari Cruz Gonzalez was the daughter of Escolastico and Pilar. She was 11 years old at the time, thin and dark-skined, and wore her hair very short. Now Mari Cruz is married, living in Spain and has four children (Gabriel was born in 1975, Juan Carlos — in 1978, Lourdes — in 1981 and Ignacio — in 1985). Many things have been said about the possible causes of her [Mari Cruz] persistent negative attitude. ‹…› This information makes me think that the negative attitude of the visionary in question, rather than being the fruit of an interior animosity, was the result of heavy pressures put on her. Eusebio García de Pesquera O.F.M.